"Green"s not just a color. It's a mindset and a commitment. For those companies and individuals who share that commitment, we provide beautiful gift options consistent with it. From recycled glass, metals & other objects to sustainable materials such as bamboo, We can provide desirable gifts in keeping with environmental concerns. Because many of our clients have a commitment to the environment, or “green initiative”, we’ve developed resources for giftware that reflect that commitment and are created from recycled or sustainable materials. 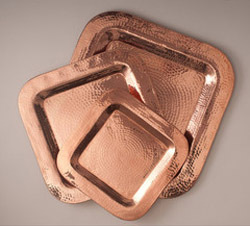 These hammered copper trays are fashioned from copper scrap. 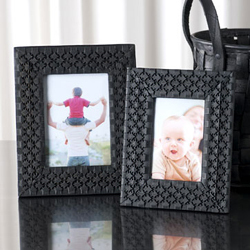 They are available in ovals, squares (shown) and rectangles ranging from 6"x12" to 27"x19". This lovely recycled glass vase and metal stand makes for an enchanting floral centerpiece when filled with your favorite blooms. Perch on kitchen counter or dining table for a touch of beauty. 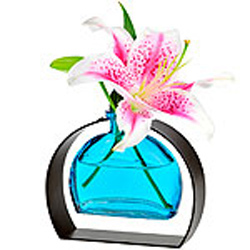 Removable vase allows for easy cleaning and arranging of flowers. Hand wash only. 5-3/4"x5"x1-1/2". Available in cobalt, lime,red, orange, fuchsia, aqua, purple and clear. ...are made from everything from recycled tire treads to recycled tin cans, old computer motherboards to telephone keys. 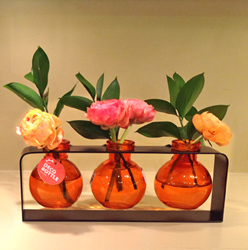 This trio consists of a lovely grouping of three clear or colored glass vases made from recycled glass. They sit in a black metal stand and perk up any space in which they sit. Availabli in purple, cobalt, magenta, orange, green, turquoise, red, and clear. Minimum order: 6 sets per solor. 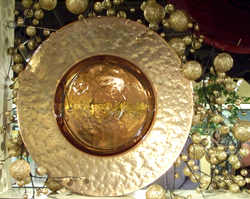 Made of 99% recycled glass, this elegant serving piece has a lustrous gold finish. 19' diameter. Makes a magnificent centerpiece. "I have worked with (HBH) several times to find gifts that say' Thank You', 'You're someone special' or 'I value what you contribute'. The ideas and recommendations always seem to reflect knowing me, my values and how I want to express myself. Ultimately, my choices of gifts make me happy (because of their wonderful aesthetics and value) and delight those I gift. ..The gift recipients recognize that they have been seen & appreciated. Relationships deepen and possibilities expand... Thanks!!" "...Yet another satisfied client. Thanks for doing a great job!"